2009 was the Year of the Homage, at least as far as magazine covers are concerned. Several of our top 10 covers referenced either recognizable cultural icons, past photographic icons or their own past covers. The hands-down winner this year was New York's "Bernie Madoff, Monster," which wickedly played off Heath Ledger's Joker from The Dark Knight. 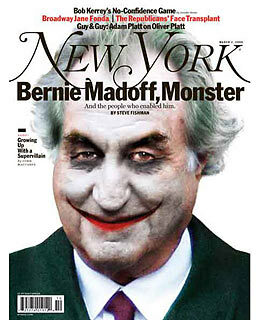 The cover, by illustrator Darrow, captured the banality of Bernie's evil by overlaying the Joker's pasty (not patsy) makeup on the smug face of Madoff. He looks like a clown, but unfortunately, he was all too serious; the joke was on us. The Joker-on-the-face soon lapsed into cliché  used and abused by everyone who wanted to vilify someone, as in the tea partiers' posters defacing Barack Obama  but New York exploited the idea first, and best. It was timely and emotionally resonant, making it the cover of the year.